Update 9/16 - Tracfone has released the iPhone 5S, 6 and 6 Plus for use on their prepaid network. See the links below to learn more. For several years now consumers who wanted to use an iPhone with Tracfone had to go through the BYOP program. 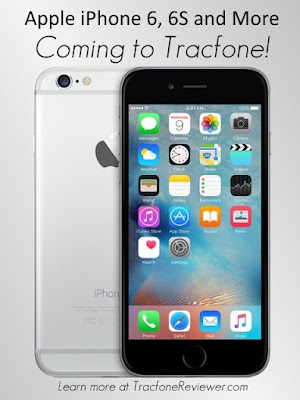 But that appears to be changing as Tracfone may be releasing several Apple phones in the near future! We recently shared details on a number of new LG and Samsung Smartphones Coming to Tracfone, which you can check out to learn about those new phones, and Tracfone has already released several of them, including the LG Treasure and Samsung Galaxy S6 (follow the links to see our reviews of these phones). Along with the Apple iPhones coming to Tracfone, there are a number of other phones from ZTE, Alcatel and Huawei also listed. We've already seen the ZTE ZMAX 2 available on HSN. We'll be working at sharing more information on these phones soon! Let's take a look at which iPhones will be coming to Tracfone. Instead of just one or two options, Tracfone appears to be delivering all of Apples smartphones going back to the 5S, which is the oldest model in this list. We are really impressed that Tracfone is going to be offering so many options, and we want to quickly cover some of the differences between the iPhone models listed above. The iPhone 6 brings a number of improvements over the iPhone 5S, most noticeably a screen size of 4.7" while the 5S only has a 4" screen. When comparing the 6 to the 6S, there are more subtle changes and improvements. The camera on the 6S features 12 MP and can capture 4K video while the 6 is only 8 MP. Both the iPhone 6 and 6S have a 4.7" screen. 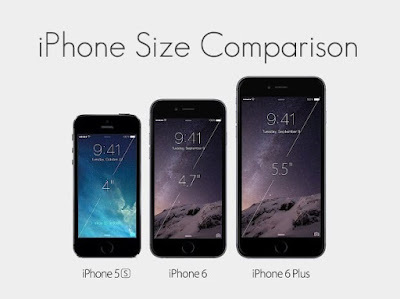 The 6 Plus is just about the same as the 6, but with a larger, 5.5" touchscreen that also has a higher resolution. The 6S vs the 6S Plus has the same setup, with the 6S Plus using a 5.5" screen. The last phone in the list is the iPhone SE, which was released about the same time as the 6S and shares various parts from the 6S, 6 and 5S. The SE has a 4" touchscreen, the same size as the 5S, but offers better resolution. It comes with the same fingerprint technology as the iPhone 6, but also has the same 12 MP camera as the 6S, which is one of the best in any smartphone. While the iPhone 6S and 6S Plus may be the most impressive of the new Apple phones, the iPhone SE coming to Tracfone is what we are most excited about. Why? Because it is a 'budget' iPhone with most of the performance and features of the 6S, but with a much lower cost. An iPhone 6S retails for $649 for the 16GB version, while the iPhone SE starts at $399. Not all Tracfone customers are willing to try the BYOP program, which is why it is so exciting that Tracfone is releasing these Apple Smartphones. We know that for many, the BYOP program is just too confusing, or they don't want to deal with trying to find a compatible phone. Tracfone has made improvements to they BYOP program over the last year, but there are still occasional issues our readers report about phones that just won't work for one reason or another. Buying an Apple smartphone directly through Tracfone will likely be much easier, although any long term Tracfone customer knows it is not always easy with Tracfone. Tracfone is really speeding up their process for introducing new phones to use with their prepaid service, and we will be doing our best to keep you up to date with the latest news. We hope you found this information useful, and leave a comment with any thoughts or questions. You can follow us on Facebook where we post news and updates when we get them. We are also on Google+. We recently posted the results to a survey we conducted, which included a question about our readers biggest complaint about Tracfone, so take a look if you're interested. 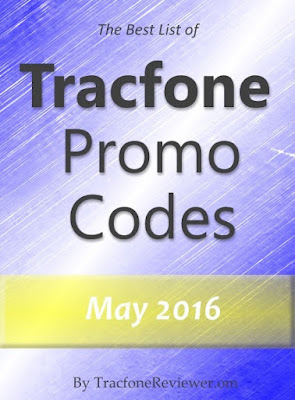 Welcome to TracfoneReviewer, a blog with information, reviews and promo codes for Tracfone. 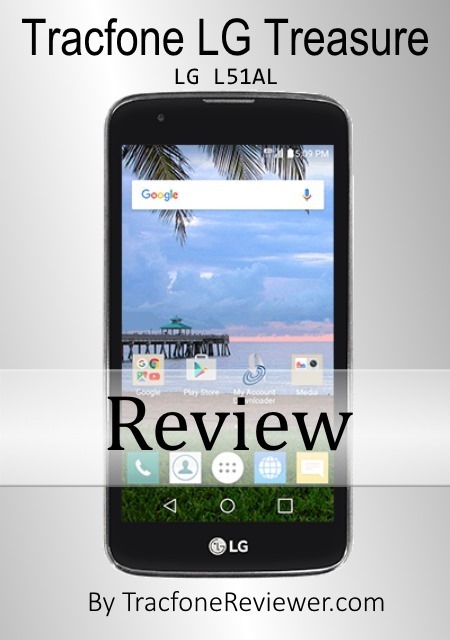 Below is our review for the new LG Treasure. We hope you find the information helpful! The LG Treasure is a mid-level (compared to other Tracfone smartphones) Android 5.1 powered phone newly available to Tracfone prepaid customers. Tracfone is beginning to release phones at a faster pace, with several new devices becoming available over the last month (including the ZTE ZMAX 2, Samsung Galaxy Grand Prime, and Samsung Galaxy S6). 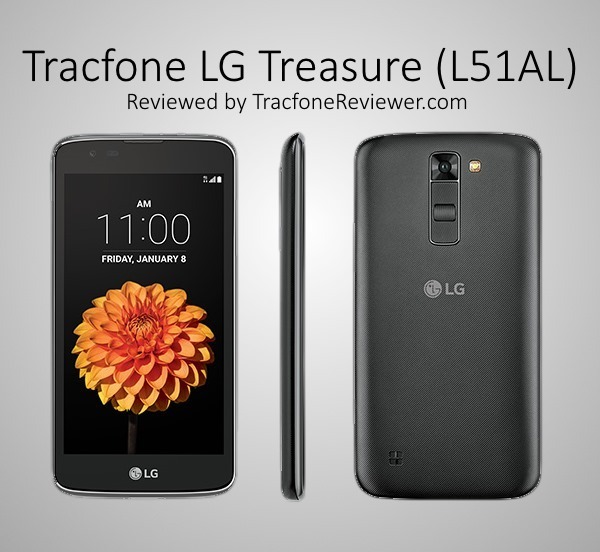 We are excited to be bringing to you today our review for the LG Treasure for use with Tracfone Wireless. The LG Treasure is basically the Tracfone version of the LG K7, which was just released earlier in 2016. Tracfone has now also released several more LG phones in this lineup, including the LG Rebel and LG Premier. For more on these other phones, visit our post, New LG/Samsung Phones Coming to Tracfone. The LG Treasure is a budget smartphone that still comes with a large screen and some great features. Many Tracfone customers are looking for smartphones that fit into the budget phone category and won't break the bank. The question many users might be wondering is if this phone is worth upgrading to from some of Tracfone's older smartphone options. We'll try to answer that a little further on, but first let's look at the quick facts for the LG Treasure. At first glance, this phone appears to deliver some great features for the price, but it does neglect a few things, like internal memory and processing power. But you can't really expect to get a high performance phone for a low cost, unless you buy a used/refurbished phone and bring it to Tracfone's BYOP program. LG is one of the largest companies in South Korea and produces a wide range of products sold across the globe. They are also one of the largest mobile phone manufacturers, and have a diverse lineup of phone options, including their new flagship phone the LG G5 which features the latest version of Android, v 6.0.1 marshmallow. The LG phones released by Tracfone to use with their prepaid service won't have quite the same performance features as LG's flagship, but they also won't cost as much. Let's take a look at the full list of features and specifications for the LG Treasure. Size: 5.65" x 2.85" x 0.35" Weight: about 5 oz. A quad-core processor combined with 5" touchscreen and Android 5.1 is a very nice collection of features that make the Treasure a desirable option for many people. But what about the 4 GB of usable internal memory, is that too little? Let's get into our review of the LG Treasure from Tracfone with our pro's and con's for this device, followed by a quick comparison to some of the other similar devices available from Tracfone like the LG Sunset and LG Ultimate 2. We really like the screen size, the dual 5 MP cameras, and that the Treasure runs Android 5.1.1. We also think this phone is a great value at the current price. The LG Treasure comes with a 5" touchscreen, which is about the average size these days for a smartphone device. The resolution isn't the best, at 480x852 pixels, but LG did a really great job on making this screen bright and clear. When taking pictures with the LG Treasure, you will notice that it has a 5 MP rear camera and 5 MP front camera. This gives you fairly good image quality for taking selfies or other photos. The rear camera also has an LED flash, while if you are taking photos with the front camera it has a neat feature that lights up part of the screen to act as a flash in low light situations. It is unusual for a budget smartphone to have such a high resolution front camera, and we hope this trend continues. The volume and power buttons are located on the back of the phone, which may be more convenient for some users, and keeps the edges of the phone free from any buttons. This is great for those of us who tend to accidentally hit the buttons on the side of phones when trying to hold them. Tracfone devices, unlike most unlocked phones, do not get Android OS updates (it has something to do with compatibility issues, and Tracfone would have to be involved in making sure the updates worked properly, but they don't currently want to do this) so it is nice to see that the LG Treasure comes with Android 5.1.1, which is a newer version that doesn't have some of the vulnerability issues previous Android versions had. Finally, we are really happy with the overall value of the LG Treasure as it is currently offered by HSN bundled with an airtime card worth $100, and the whole bundle is going for $99, making the phone free. If you need airtime anyway, you might as well upgrade to this phone. But before we get too far ahead of ourselves, lets look at a couple of concerns we do have. There are two main concerns we have about the LG Treasure and we want to mention to help our readers before they buy this phone. First, the LG Treasure only comes with 8 GB internal memory, of which, only about 4 GB is actually usable (the other 4 GB is used by the OS and pre-installed apps). For many users, this won't be a big deal because most of Tracfone's other smartphones, like the LG Sunset and LG Ultimate 2, have a similar amount of internal memory. Just keep in mind that you can't load this phone up with too many photos or large applications. Some apps can take up a full GB of space, so you would run out quickly. The LG Treasure does come with a Micro SD card slot, which allows you to use up to 32 GB of external storage. This is great if you have a lot of music or other files you want to add. The second concern we have is with the processor performance. The Treasure comes with a 1.1 Ghz quad core processor. This is more than enough power for everyday apps like Facebook, Instagram or calling/texting. But if you want to running larger, resource intense apps like certain games, you may run into performance trouble. The Treasure does have 1 GB RAM, which is average, yet overall we think the average user won't have any issues with performance. That concludes our likes and dislikes, let us know in the comments if we missed anything, or if there are certain features you like/dislike! Update - initially it appeared that the LG Treasure would have 1.5 GB RAM, but it urns out to only have 1 GB RAM. The LG Treasure is similar or an improvement over the LG Sunset and LG Ultimate 2 in almost every way, which makes sense since it is much newer. The improvements, however, are generally only small improvements. Compared to the LG Ultimate 2, the Treasure comes with a larger screen (5" vs 4.5") a better processor (quad-core vs dual-core) better cameras (5 MP front and rear vs 5 MP rear camera and 1.3 MP front) and more internal memory (8 GB vs 5 GB). The LG Treasure also comes with Android 5.1.1 versus 4.4 which the Ultimate 2 come with. These improvements are noticeable, but not huge. If you are currently using an Ultimate 2 and considering upgrading, the Treasure would probably be a little faster and have a little better performance overall. One important piece of information to note is that the Ultimate 2 is a CDMA phone that uses Verizon towers while the Treasure is a GSM phone that uses AT&T service. So be sure to check your coverage before switching. The differences between the LG Sunset and Treasure are a little less noticeable, but still exist. The LG Treasure has a newer processor but slower speed (1.1 Ghz vs 1.2 Ghz) a larger screen (5" vs 4.5") slightly newer Android OS (5.1.1 vs 5.0.1) and better front camera (5 MP vs 1.3 MP). They both have a quad core processor, 8 GB internal Memory and 4G LTE service using AT&T cell towers. The LG Treasure is an upgrade over the LG Sunset, but we might only suggest you upgrade if you are also in need of the airtime that comes in the bundle. Otherwise, you might want to want and see what other phones Tracfone releases in the coming months. The LG Treasure brings great features including a 5" touchscreen and Android 5.1.1 at a very reasonable price making it a great upgrade from older Tracfone smartphones. It doesn't have the performance to match some of Tracfone's other recent releases, like the Samsung Galaxy S6, but it also is significantly cheaper. You can find the LG Treasure bundled with a 1 Year/400 Minute airtime card (and other items) on HSN where it is currently on sale for $99. You can also view Tracfone's Tutorial to learn more about how to use this device. There is also a CDMA version of this phone which we expect to be released sometime in the near future. We hope you found this review useful, and if you have any questions or thoughts you can share them in a comment below. Are Data Cards a Good Deal from Tracfone? And if you want to keep up with the latest news and info, join us on Facebook! A few weeks back we created survey for our readers to take to help us get a better idea of who our readers were, what they are interested in, and ways we can improve the TracfoneReviewer blog. We received over 260 responses in about a week, and a lot of helpful information. We want to share some of the more pertinent pieces of information from the survey with our readers as we found it very interesting and thought you might as well. You can go back and see the original post about the survey here, but it is no longer possible to take the survey. We will start by just looking at the first five questions from the survey, as they are more generalized. Question 1 - How Long have you been Using Tracfone? In the first question of our survey we wanted to get a better idea of how long people have been using Tracfone. We were quite surprised that the majority of respondents to the survey (55%) had been using Tracfone for six years or more. Another 30% have used Tracfone for three to five years. How Long Have You Been Using Tracfone? We believe both statements may be partially true. Apparently America Movil, Tracfone's parent company, did lose almost half a million subscribers in the US during the first quarter of 2016 according to an article on FierceWireless. Tracfone and Safelink were where most of these subscriber losses occurred, but America Movil also owns Straight talk and several other prepaid cell phone companies. Overall, America Movil has over 26 million users in the US across all their MVNO brands. So, while Tracfone hasn't had the best year so far, we expect they are doing fine, and will be working hard to attract more new customers (hopefully with new and improved smartphones). Question 2 - Why Do you use Tracfone? To help understand what is important to our readers, we asked, 'Why do you use Tracfone?'. The answers were fairly consistent with what we expected, with the most popular answer being the low cost. Take a look at the graph below for the full breakdown. Why do you Use Tracfone? Some of the 'Other' responses included those who use Tracfone for multiple reasons, like low cost and low use. With the majority of people choosing Tracfone because of the low cost, we have to wonder why Tracfone released the expensive Samsung Galaxy S5 and Samsung Galaxy S6. But perhaps they are just trying to appeal to the small segment of consumers who are willing to spend on a high-end device, but still want to use prepaid service. It does look like Tracfone will be releasing several new mid-level Android LG phones which should appeal to more customers. Question 3 - What is your Biggest Complaint about Tracfone? Tracfone is a low cost cell phone carrier, and as such, they seem to skimp when it comes to certain things like customer service and quality. We see a fair number of comments on the blog with various issues and so we wanted to get a better idea about what the most common complaints about Tracfone were. Lack of Smartphone options was actually the biggest complaint, with poor customer service coming in second. You can see the top four in the chart below. We were pleasantly surprised by the number of 'Other' answers which mostly consisted of people responding that they didn't have any complaints about Tracfone. The remaining 11% of our survey respondents choose Problems with Phone, Roaming Issues, Airtime Lost/Stolen or BYOP Problems as their biggest complaint. Question 4 - Is your Tracfone Device your Primary Cell Phone? We often see consumers who use Tracfone just as their backup or emergency phone, and not for everyday use. So we were curious about how many people use their Tracfone device as a primary phone versus a secondary or backup. As it turns out, the majority of respondents use Tracfone as their primary phone. About 23% reported that they use it as a backup. As Tracfone continues to offer newer phones we suspect more will switch to using Tracfone as their primary device. However, for those who need to make frequent calls or texts (or use data), using some kind of unlimited cell phone plan makes better economical sense. Question 5 - What Type of Phone do you Currently Use? We asked this question about what type of phone customers currently use not only because we were curious, but also to help us do a better job tailoring the content towers our readers. We were somewhat surprised to see that 65% of our survey respondents use a smartphone from Tracfone. This does make a lot of sense, as Android phones from Tracfone offer lots of neat features (like Android OS) and there are a lot of great deals for buying phones and minutes bundled. An almost equal number of respondents use either a non-smartphone from Tracfone or the Tracfone BYOP program. This concludes our breakdown of the survey results. We may may create another post with analysis of some of the other questions in the future. We want to thank everyone who participated in our survey and helped provide the responses. We are excited to continue to work at delivering information to our readers and the survey results have already helped. Leave a comment below with any thoughts or questions you might have and if you're new to this blog take a look around as we have a wide variety of Tracfone related information. We also have a Facebook page with over 1800 followers that make up a helpful community. TracfoneReviewer is a blog dedicated to providing helpful information about Tracfone Wireless and each month we collect and share the latest promotional codes with our readers. Below are the latest promo codes, and be sure to check out the rest of our blog which has reviews, news and other useful information. These promotional coupon codes from Tracfone are used when adding a new airtime card to get additional minutes for free! You can get 40-300 extra minutes, depending on which airtime card you are using. For the best value, the 1 Year/400 Minute card should be your choice because you also get an extra 300 minutes using the bonus code listed below! But not everyone wants to buy a full year of airtime, so we've got you covered with other codes as well. Promo codes are for specific airtime cards, but can also be used with any card of greater value, besides the 1 Year/ 400 Minute card. For example, a code for the 60 minute card can also be used when adding a 120 minute card, 200 or 450 card. Those who have smartphones cannot use promotional codes unfortunately, but you do get to enjoy using a powerful device with inexpensive prepaid service, and you can also buy only texts for your phone if you need to. We recently reviewed the Samsung Galaxy S6 which was just released to Tracfone, as well as wrote about several new LG and Samsung Devices coming to Tracfone soon. Take a look at these posts if you're thinking about switching to a smartphone, or looking to upgrade. The codes below are just the newest we've collected for the month of May, but you can see our full list of codes on our main Tracfone Promo Code page. Now, let's get to these new promotional codes! Some codes can be used multiple times, while others are one use. Also remember these codes won't work for Android smartphones. Also, enter code 32801 to get $15 off your purchase of a 1 Year/400 Minute airtime card on the Tracfone website. These are the latest codes to use for May 2016 with Tracfone. Let us know what code you used, and how it worked for you in the comments below! If you're somewhat new to Tracfone, we created a Beginners Guide to Tracfone which contains lots of helpful information, so have a look! Also take a look at our latest Deals and Discounts on Tracfone Devices and Minutes for some of the lowest prices on Tracfone items. Keep in touch by following us on Facebook where we have a growing community of Tracfone users and post news, updates and more. Thanks for visiting, and we hope these codes get you some extra minutes for free!